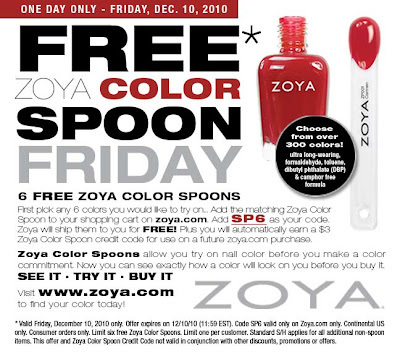 Scrangie: Zoya Free Color Spoon Friday! If you're unsure of what Zoya Spoons are, feel free to check out my post on Spooning! I have never tried Zoya before . This is the perfect excuse to try :) Thanks! At first, I couldn't place my order, because the site was acting up. Now, I'm waiting to find out if Collection Plates/ Color Plates that are showing up as 'Free' in my Bag are the same as Color Spoons. I'm not going to get Color Spoons of polishes that I'll get on the plates, because thats silly & redundant. Anybody know something about these? @ auroragyps: I had trouble with the website too-took three hours to get six spoons into a basket, input my info, and I checked out. For some reason, checked back the next day, still had a full basket even though I was given an order number...not sure what's going on, if I'll receive the spoons or not...very weird. Did anyone ever receive their free spoons? I added them to my cart and even had an order number (though silly me didn't write it down)-- I logged in today thinking "Hey, whatever happened to those spoons I ordered? ", and they're still in my basket, like I never ordered them. This was my first time shopping with Zoya. This doesn't do wonders for their image in my brain, which is a damn shame, because they have some gorgeous polishes. Well, their customer service chat took ages to figure it out (First saying they couldn't find my account, which is odd since I was logged in as I chatted to them, so it definitely exists... Then taking 10 minutes to tell me to please hold a second.). But they're now telling me my order didn't go through (despite giving them my credit card info and getting a confirmation screen). Thankfully the chat-helper I spoke with said she would go ahead and process it if I emailed her my choices, so a month later, I might still get them. So if the spoons are still in your cart, you might want to hop on the chat and do the same thing. Kinda wish I had them now, as I would've liked to have taken advantage of the 3 free polishes via their facebook, though.